Izraelske obrambene snage (IDF) u Izraelu uobičajeno zvane po skraćnici צה"ל (čita se Cahal), predstavljaju oružane snage sastavljene od Kopnene vojske, Zračnih snaga i Mornaričkog korpusa. 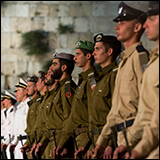 The Israel Defense Forces (IDF) "Defense Military of Israel", commonly known in Israel by the Hebrew acronim צה"ל, pronounced Tzahal), is Israel's military forces, comprising the Israeli Army, Air Force and Sea Corps. 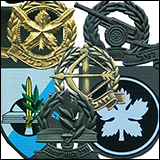 IDF soldiers have three types of insignia (other than ranks) which identify their corps, specific unit, and position. 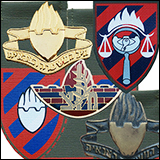 Corps are identified by a pin attached to the beret. 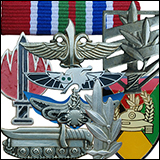 Soldiers serving in staffs above corps level are often identified by the General Corps pin, despite not officially belonging to it, or the pin of a related corps. 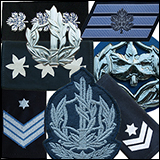 New recruits undergoing basic training do not have this pin. 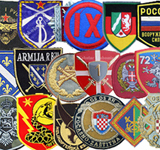 Beret colors are also often indicative of the soldier's corps, although most non-combat corps do not have their own beret, and sometimes wear the color of the corps to which the base they're stationed in belongs. 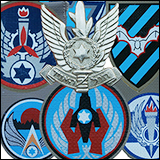 Individual units are identified by a shoulder tag attached to the shoulder strap. 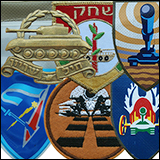 Most units in the IDF have their own tags, although those that do not generally use tags identical to their command's tag (corps, directorate, or regional command). 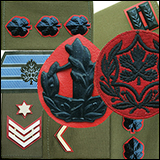 While the position/job of a soldier cannot often be identified, two optional factors help make this identification: an aigullette attached to the left shoulder strap and shirt pocket, and a pin indicating the soldier's work type (usually given by a professional course). 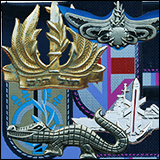 Other pins may indicate the corps or additional courses taken. 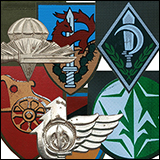 Finally, an optional battle pin indicates a war that a soldier has fought in.